Модальный глагол can, could, be able to. Упражнения. Данный материал составлен Затонской А.С. и входит в цикл уроков для уровня Upper-Intermediate и Advanced. Материал основан на лексике по теме Meals. Exercise 1. Choose the modal verb which, from your point of view, suits the situation better. Remember – your choice is of vital importance – how many troubles happen because of misunderstanding! The cake (must, can, is) be almost ready now. – Are you sure? – Yes, practically. You (must, have to, should) put sausage, cucumber, onion, potatoes, eggs and sour cream to make the Russian salad tasty. (can, may, should) you have failed to put sugar and vinegar in the biscuit again? How (can, are able to, may) you be so careless? You (may, can, have to) take the fork, knife and plate. I don’t need it any more. The beefsteak (can’t, mustn’t, shouldn’t) be so raw and untasty. I’ve cooked it properly! (Should, shall, ought to) I buy a loaf of bread or some curds? No, you (can’t, mustn’t, shouldn’t) eat ice-cream in the street in winter. (shall, may, can) it be that the pork was spoiled? (could, must, will) you show me how to slice the cabbage and carrots for this soup. You (could, might, have to) have cooked lunch before our arrival. You’ve overfried the potatoes. You (should, could, might) be more accurate about cooking. Don’t put too much salt in the dough. We (can, may, might) spoil everything. (can, may, should) it be that the child has eaten so much candies? Don’t you know that one (can’t, mustn’t, needn’t) eat milk and cucumbers? Exercise 2. A. Complete the sentences. 1.You should have … . 2. … have baked it properly. 3. Could you … ? 4. … be putting apricots and apples in the cake now. 5. … have treated him with another portion of mashed potatoes and pork. He may be offended. 6. You can … 7. … have laid the table before our arrival. 8. You might … 9. Shall I … ? 10. … that she’s still peeling potatoes? 11. … drink such hot tea – it’s harmful for your stomach! 12. … keep to a diet, you’ve promised! 13. You can’t … . 14. Can it be that … ? 15. … have failed to fry potatoes? This is so simple! 16. … ? – No, you may not. … keep to a diet! 17. Not to die … eat and drink. 18. … have helped me! Now I have to do all the cooking by myself! 19.What’s wrong? – The child has taken a knife. – How awful! He … hurt himself! – Well, luckily it hasn’t happened. 20. Where’s Ann? — I don’t know. She … now. – Oh, no. She … now. – Are you sure? – Practically. 21. How careless you are! You might … . 22. Why did you have to … ? 23. You are to … . – Why? – It is written in the recipe-book. 24. You … . – Yes, I’m sorry I’ve done it. 25. What shall I do now? – You should … . 26. It would … . – Oh, yes, I stick to this idea! B) Invent short dialogues using these sentences. Exercise 3. Transform the sentences into the sentences with modal verbs. 1.It’s unlikely that both the turkey and the tart will be cooked by supper. I suggest us having dinner in a cafe. 2. I’m not quite sure, but he probably has already bought macaroni and mutton. 3. You probably noticed that the meat must be sliced before stewing. 4. Why did you put so much pepper and onion in the soup? It was quite unnecessary! 5. I’m practically sure that if you add cabbage and carrot to the stewed meat it will become tastier. 6. Have you already eaten the whole tart? It is unbelievable! 7. Perhaps they have already come back from the market. Maybe they have bought strawberry, lemons, tangerines, apples and plums – that is, everything we’ll use for the fruit salad. 8. Don’t forget that it is your duty to lay the table and to wash up. 9.I want to give you good advice – go to the market if you really want to buy tasty and ripe fruits and vegetables.10. According to our time-table you will have breakfast at 9.00, dinner at 14.00, and supper at 19.30. Remember it, please. 11. I’m very disappointed in you – I thought you would cook the food and choose the crockery for the anniversary dinner beforehand. 12. No, I don’t give you the permission to drink wine. You’re too young for that. Besides, you take an exam tomorrow. Exercise 4. A. You are in an English restaurant where you are invited to take part in a funny competition – Who knows more jokes and anecdotes about meals, restaurants, waiters, and so on. You are strongly willing to win, but to take part in the competition you should first translate all that into English. 1. Владелец ресторана обращается к официанткам: «Сегодня вы должны быть особенно вежливы?» — «Почему? К нам должен прийти важный гость?» — «Нет, но у нас сегодня мясо более жесткое, чем обычно». 2. «Я никак не могу тебя понять»- говорит сердито жена своему мужу. «В понедельник ты ел котлеты, они тебе нравились, во вторник – нравились. В среду – нравились, а в четверг ты заявляешь, что ни в какую к ним не притронешься! Мог бы быть более последовательным в своих вкусах!» 3. Плотно пообедав, посетитель ресторана сообщает хозяину, что он забыл дома бумажник. «Не нужно беспокоиться, сэр, за меня может поручиться мой друг, мистер Смит». – «Не знаю я никакого Смита!» — «Придется вас познакомить!» 4. «Вы не могли бы принести мне один бифштекс?» – «С каким гарниром?» – «Просто ваш бифштекс. Мне нужно подложить его под ножку стола, чтобы он не качался!» 5. «Похоже, она все-таки научилась готовить: ее третий муж выжил». 6. В ресторане. «Порция, которую мне дали сегодня, должно быть, в два раза меньше, чем та, которую мне дали вчера.» – «Может быть дело в столике, за которым вы сидели?» – «Я сидел у окна». – «Действительно, посетителям за теми столиками нам приходится давать порции в два раза больше – это реклама!» 7. «Официант, из чего сделан этот бульон? Не может быть, чтобы в нем варился цыпленок!» – «Цыпленок, сэр, но в самом раннем детстве!» 8. Во время обеда мать говорит дочери: «мясо, должно быть, не доварилось». – «Не может быть. Я готовила его точно по рецепту: 1кило нужно варить час, а я купила полкило и варила его полчаса!» 9. На пикнике: «Да нет, трава не сырая. Просто ты, наверное, села на картофельный салат!» 10. Компьютер спросили: «Все ли грибы может есть человек?» –«Все, но некоторые один раз». 11. Посетитель в ресторане несколько раз пытается получить от официанта стакан воды. Наконец, отчаявшись, он спрашивает другого посетителя: «Как вы думаете, что я должен сделать, чтобы мне все-таки принесли воды?» – «Может быть, попробуете себя поджечь?» 12. «Не могли бы вы мне сказать, официант, как часто у вас меняют скатерти?» – «К сожалению, не могу – я работаю здесь всего лишь два месяца». Exercise 6. You bump into an acquaintance of yours whom you know as an extreme heavy-eater. He has just come from a restaurant and wants to share his “menu” with you. Of course, you are surprised by his ability to eat so much, you even doubt it! Express it. Exercise 7. Even if you are not a heavy-eater I am sure that each of you has your favorite meal. So exchange your favorite recipes and extend each other’s “cuisine”. Don’t forget that you give each other good advice. Exercise 9. Write a recipe-book. Remember that you should use different modal verbs to express different shades of meaning. 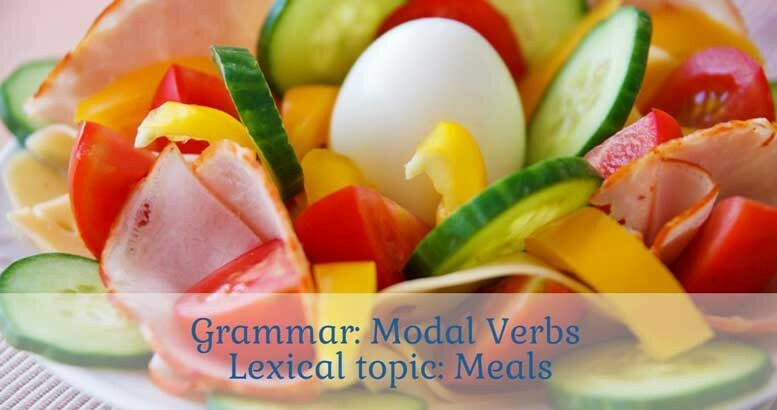 For example, if you speak about how traditional dishes should be served the modal verbs “should” “ought to” will be in place; if you speak about the technology of food cooking you should use the modal verbs expressing advice or rule, and so on. Ex. 2. Your own answers. 1. The turkey and the tart won’t be cooked by supper. I suggest us having dinner in a cafe. 2. He might have already bought macaroni and mutton. 3. You may have noticed that the meat must be sliced before stewing. 4. You needn’t have put so much pepper and onion in the soup. 5. Cabbage and carrot must make the stewed meat tastier. 6. You can’t have eaten the whole tart! 7. They could have already come back from the market. They may have bought strawberry, lemons, tangerines, apples and plums – that is, everything we’ll use for the fruit salad. 8. Don’t forget that you must lay the table and wash up. 9. You should go to the market if you really want to buy tasty and ripe fruits and vegetables. 10. According to our time-table you are to have breakfast at 9.00, dinner at 14.00, and supper at 19.30. Remember it, please. 11. I’m very disappointed in you – you should have cooked the food and choose the crockery for the anniversary dinner beforehand. 12. No, you may not drink wine. You’re too young for that. Besides, you take an exam tomorrow. She must have learned to cook: her third husband survived. The computer was asked, «Can people eat all kinds of mushrooms?» «Yes, they can, but some kinds only once». Оставьте первый комментарий для "Упражнения на модальные глаголы. Modal verbs exercises"